With attractive flowers, and the ability to attract bees to the garden in winter to spring, the small flowering camellias have an attraction of their own. These miniature flowering varieties present the landscaper with point of difference to the larger and denser growing C. japonica and C. sasanqua types. Excellent in a cottage garden style design, or as a background plant in the border. Although, we think they look great near the front of the border, where the flowers can be shown off to best effect. C. yunnanensis with its striking white flowers, is one that deserves a prominent position. The flowers may be small, however the growth habit varies greatly, some are extremely slow growing, others more vigorous. Most are hybrids from species such as C. transnokoensis, C. lutchiensis and C. rosiflora, and with variety in flower colour as well as size some have fragrance that their larger relative often lack. Some such as C. Mandy are more winter flowering types than others. With a slightly weeping habit and very attractive pink flowers. C. Mandy can be pruned every year to maintain a good size. One of the best known small flowering Camellias would be C. Wirlinga Bride, this is C. lutchiensis hybrid with a weeping habit. Slow growing and winter flowering. It would reach 2 metre if left unpruned. Camellia ’Spring Festival’ with its pink flowers is another strong growing variety and wallflower well into spring. Camellia ‘Blondy’ is one of the slowest growing of all, it may take 15 years to reach 1 metre, a habit than has many benefits in smaller gardens. Masses of small white flowers in spring cover the plant. One of the white flowering varieties isCamellia tsaii, a slight weeping habit and attractive fine pointed leaves. Strong growing and this is one that can be used as hedging plant. Camellia ’Tiny princess’ is another with a weeping habit slow growing with pale pink flowers in spring. From Japan we have Camellia Isaribi, pink flowers in spring and will reach 2 metre plus if left unpruned. 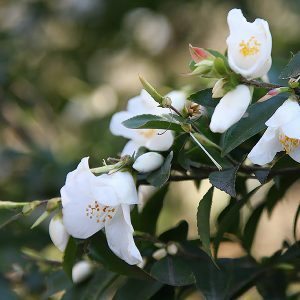 Camellia Cinnamon Cindy, attractive white flowers and it is a very strong growing plant that can be pruned every year, this is a upright growing type, well suited to smaller spaces. 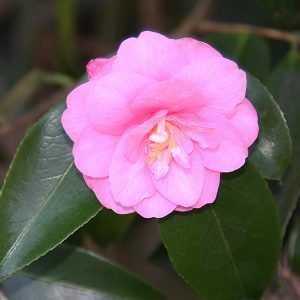 Like all Camellias, the miniature flowering types have shallow root systems and prefer a well drained humus rich soil. They can be planted as a feature plant, and some take so well to being pruned that they can be used as hedging plants. Small Flowering Camellias are best pruned carried out directly after flowering. Propagation is from semi hardwood outings, best taken in summer.